The Allen Theatre, in Cleveland’s PlayhouseSquare, was built to be a movie house. No theatrical trappings were included. It was a long skinny theatre. No attention was given to sight lines, backstage or wing space, or a fly gallery for scenery or set pieces. It was beautiful, but anyone who saw a theatrical production in the space quickly became aware that the acoustics, the ability to clearly see the stage from the hinterlands of the very deep seating areas, were lacking. All of that has changed. The new Allen is everything that the old Allen wasn’t, except for its initial beauty and the adjustments that have been made to transform the space into a warm, audience friendly contemporary theater. And, to make things even better, shortly, there will be two more theaters added. Those changes will give CPH something it has never had – flexible spaces that will allow for the selection of a broad range of plays which can be performed in an intimate proscenium, and a flexible black box which can be configured to the needs and wants of the director. 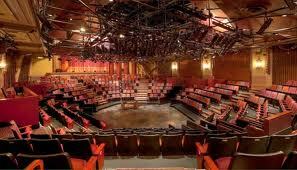 Yes, theater in the round, thrust theater or any configuration needed. The audiences will be close to the action, the lighting and other theatrical necessities will be top notch and the newest in design. It’s a new beginning for America’s first professional regional theatre. CPH inaugurated the facility with a startling production of Galileo. Much of the staging and special effects would have been impossible in the company’s former venue. •I find the new Allen warm and enfolding. •I love that the designers kept the beautiful old world look of the lobby. The clever use of contemporary carpeting design, which is in the same tones as the ornate walls and decorations, was a stroke of genius to blend the new with the old. •Inside the theatre, I like the use of metallic scrim to allow for seeing the decorative walls, but blocking them out once the show starts. •I am disappointed in the seating. In the permanent seats section the rows are somewhat tight. Unlike the redone Hanna, you can’t walk to your seat without others getting up. Because of the shallow raking of the first set of rows, smaller people will have trouble seeing over those sitting in front of them. (My 4’ 10” wife had to sit on two folded coats in order to see the stage clearly.) More than one person complained of hitting their knees on the cup holders which jut into the rows, making for awkward dodging around fellow row members on exits and entrances.